You can’t very well talk about fall fashion without mentioning boots—they’re a season staple, after all. For the stylish woman on the go, premium boot brand SOREL offers an assortment of current styles, from calf-grazing lace-ups to luxe ankle booties. So whether your wardrobe reads “rugged outdoors” or “city slicker,” there’s a SOREL boot for you. Keep reading for three different ways to wear SOREL this season and shop the must-have boots from the fall collection at Nordstrom today. 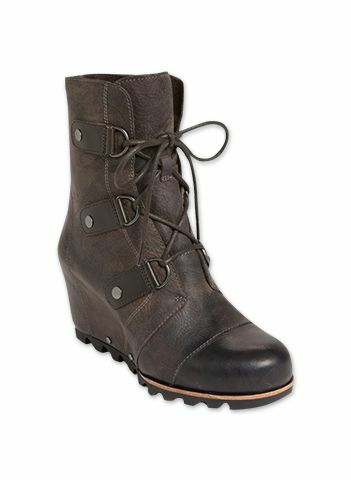 Brave winter’s chill with SOREL’s Conquest Carly Boots ($220) in Black. Tucked-in jeans and a chunky knit sweater create a weekend-ready vibe, while a menswear-inspired wool coat keeps the look feeling pulled together. On Kassi: Theory Elibeth Wool Blend Coat ($755) in Dark Charcoal and Innis Crewneck Sweater ($285) in Oatmeal; Miss Wu Vera Lace Print Silk Blouse ($225) in Vera Lace Print; PAIGE Denim James Crop Jeans ($114) in Aero; SOREL Conquest Carly Boots ($220) in Black. Accentuate the cool factor of SOREL’s Slimpack Riding Boots ($210) in Shale with ‘90s touches, like a field jacket, stripe tee, and a plaid shirt tied around the waist. On Kassi: BB Dakota Tawny Studded Anorak ($98) in Army Green; T by Alexander Wang Stripe Linen Tee Shirt ($125) in Ink and Ivory; Wayf Plaid Flannel Shirt ($49) in Red/Green; T by Alexander Wang Bonded Jersey & Neoprene Skirt ($230) in Black; HUE Ribbon Leg Warmers ($14) in Black; SOREL Slimpack Riding Boots ($210) in Shale. For a riff on Katharine Hepburn in the ‘40s, team SOREL’s Joan of Arctic Wedge Boots ($239.95) in Grill/Black with high-waisted trousers cuffed at the ankle.